Hyde Park Lodge is a Grade II Listed building of 1825 by Decimus Burton. 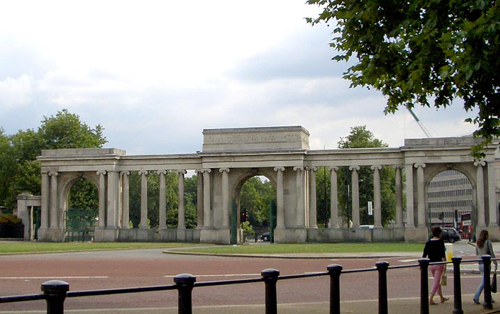 It is located at Hyde Park Corner, to the north west of Wellington Arch and west of the Decimus Burton Screen which marks the Hyde Park Corner entrance to Hyde Park. 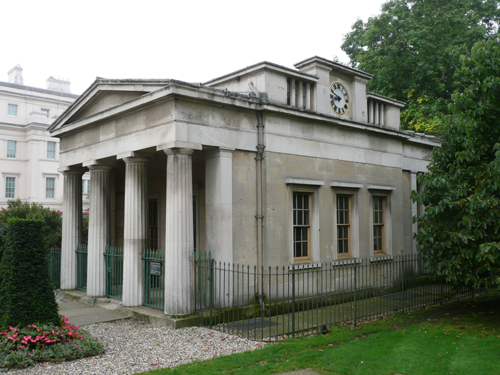 The building is of stone in a classical idiom with Greek columns and pediments over the east and west elevations. The accommodation is arranged over three floors – basement, ground and first floor. To the west of the property is a sunken courtyard with an apsidal end. 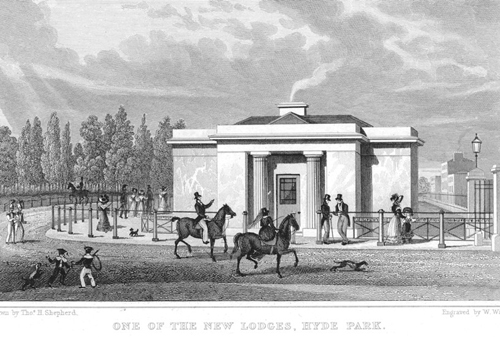 One of the (other) New Lodges, Hyde Park. I was asked to produce a rationale for the decoration of the interior and exterior citing historical precedent. Work has also been carried out on the neighbouring Apsley House. Glimpses of the Lodge can be seen in this wonderful film of 1948 Wellington Arch.